More than 345,000 blue-collar foreign workers may join the nation’s workforce through the first five years of a new working visa system set to be introduced in April, if it wins approval by lawmakers, the government said Wednesday. Of the 14 selected industries the nursing care sector is estimated to take in the most with between 50,000 to 60,000 hires, according to the figures. The restaurant industry is predicted to come second, with 41,000 to 53,000, followed by 30,000 to 40,000 workers for the construction sector and building-cleaning firms taking in 28,000 to 37,000 workers. The figures were released after the government was lambasted by opposition parties for refusing to predict how many foreign individuals were expected to enter the country under the new visa system. Japan officially bans unskilled foreign workers from employment in the country, although a vast number of migrant workers with student and intern trainee visas have been employed to meet acute labor shortages resulting from the country’s rapidly graying society. The government is aiming to create two new visa categories for blue-collar foreign workers under a new immigration bill that is now being deliberated in the Diet. The current extraordinary session continues until Dec. 10. Still, the Diet affairs chiefs of six major opposition parties agreed earlier Wednesday that they would try to block enactment of the bill during the current session — a step would probably lead to an all-out parliamentary battle against the ruling bloc, which is headed by Prime Minister Shinzo Abe. The opposition bloc, led by the Constitutional Democratic Party of Japan (CDP), also agreed that a special Diet committee on constitutional issues should not be convened for the time being. The resistance could derail Abe’s much-publicized plan to submit his own draft proposal revising the war-renouncing Article 9 of the Constitution during this Diet session. Abe has argued that the article need to be revised to formalize the legal status of the Self-Defense Forces. But opposition parties maintain that the proper “political environment” is not in place to discuss such a controversial issue. “(The immigration bill) could impact society and the future of Japan in various ways,” said Kiyomi Tsujimoto, the Diet affairs chief for the CDP, while speaking with reporters after meeting the other five opposition leaders. “The ruling bloc appears to prioritize its own political schedules, but that would only create fertile ground for future problems,” he added. Opposition lawmakers have maintained that the government lacks a clear plan on how to manage the numerous foreign migrant workers expected to come to Japan, including how to fix the existing much-maligned “intern trainee” system that has already introduced 258,000 foreign migrant workers to the nation. The opposition argues that problems in the trainee system must be fixed first before introducing more blue-collar workers under a new visa system. Officially, the trainee system aims to help foreign workers from developing countries acquire skills by allowing them to take temporary jobs in Japan where they can gain experience. 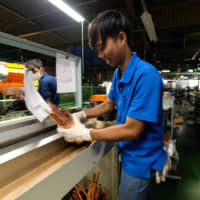 But many Japanese employers in the program have been criticized over the low wages they pay and the poor working conditions their employees are forced to endure. According to media reports, the ruling parties have already started to consider extending the term of the current 48-day extraordinary Diet session, given the tight parliamentary schedule. But an extraordinary Diet session, even if extended, usually ends by late December, which would not leave much time for the ruling bloc to enact the immigration bill. The opposition parties, for their part, have been emboldened to take the offensive by the apparent shortcomings of the planned new visa system, as well as scandals involving several Cabinet members — in particular those involving regional revitalization minister Satsuki Katayama. Katayama, a former Finance Ministry bureaucrat and the only woman in Abe’s 19-member Cabinet, was recently grilled by opposition lawmakers over allegations she received ¥1 million in 2015 from a manufacturing company for trying to secure favorable treatment for the firm from a national tax agency official. Katayama has strongly denied the allegation. However, questions over Katayama handling of funds were renewed Tuesday after her office issued a statement admitting dozens of errors in her official annual fund reports between 2014 and 2016. Katayama failed to report income she received under 34 items totalling ¥4. 5 million and 6 items of expenditures totalling ¥903,000 during the period, according to the statement. The number of errors is large, said Kazuhiro Haraguchi, the Diet affairs chief for the opposition Democratic Party of the People. “You can’t contemplate such (mistakes), usually,” he said.